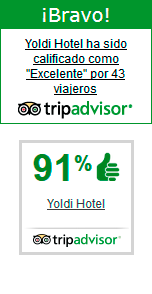 The Hotel Yoldi offers well-appointed single rooms with the highest standards of comfort and the services required to provide you with a pleasant stay. Led TV with a connection for your PC, Canal Plus, writing desk, mini-bar, strong box, air conditioning and a completely refurbished bathroom. You can also enjoy our room service, with an extensive menu including a wide range of products from Navarre. And all our rooms have free WIFI access, to allow you to browse with your laptop, tablet or Smart phone. With no waiting times or limits. and absolutely FREE. We also offer a late check out service, just in case you need to leave the hotel after 12:00 hours on your check-out day. (up to 15.00 hours at the latest, provided that this is possible in terms of occupancy and that you have requested this beforehand). You can request this option when making your booking. And if you want to come with your pet, there’s no problem at all, because the Hotel Yoldi accepts your pets as another member of your family. Whether you’re coming for busines or pleasure, whether you’re just passing through or staying a while, the rooms at the Hotel Yoldi offer you comfort, convenience and tranquillity right in the heart of Pamplona.